This goes under unsubstantiated rumor so don't get too excited (or annoyed). 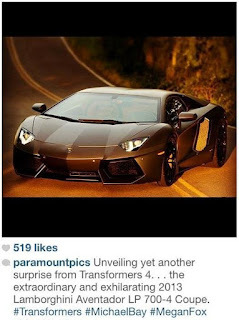 An accidental hashtag on Paramount Pictures Instagram account combined with comments from MichaelBay.com admin Nelson suggests that maybe Megan Fox returns in some capacity for Transformers 4. 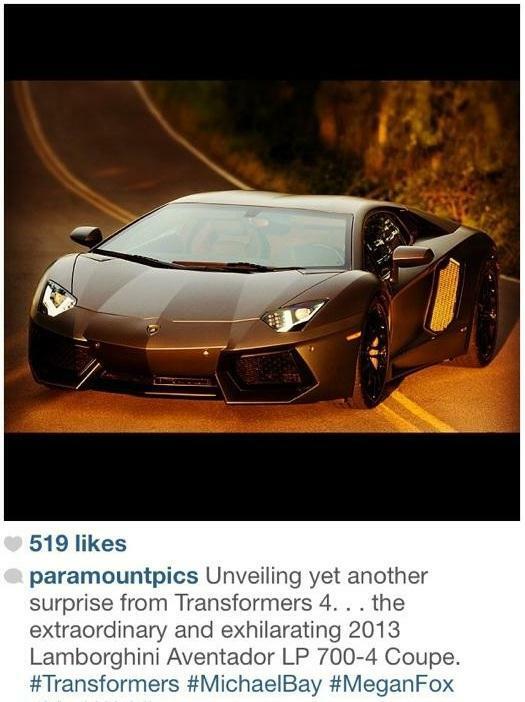 The since pulled picture had a hashtag of #MeganFox with an image of the Lamborghini Aventador LP 700-4 Coupe. When asked about this error Nelson at first thought it was fake because the post is more then 140 characters but when told it was on Instagram he said "My bad. Someone's in trouble. It's gonna be a long week." Update: The Shoot for the Edit twitter feed run by MichaelBay.com admin Nelson provided a simply "No" when asked if she was returning. Later he tweeted an article from April where Michael Bay said Fox was not returning to the franchise. So while this could be a trick...I just don't seem them bothering. To be blunt Fox doesn't have the star power to be worth the trouble nor would the "surprise" of an appearance accomplish anything useful fan service of value like the Wolverine cameo did in X-Men First Class. If Michael Bay wants to fix the Transformers3 mess a bit then he surely need Mikaela character back on screen .. and not just a small cameo. No Megan Fox please she ruined the first two thank goodness she wasn't in the 3rd one. Maybe she just cameo's as a worker/mechanic??? @Anonymous 6/10/2013 12:04 AM: The first two movies had excellent mood and spirit, Megan Fox was perfect for the role. Transformers 3 leading top-model actress couldn't act a little bit, a silly joke and she isn't even hot. Also Transformers3 had an higher boxoffice gross only thanks to 3D inflated ticket prices, the actual number of viewers was lower. And Hasbro sold less toys and merchandise too. Along with less DVD/Blu-Ray disc sold. Transformers2 is the movie of the franchise with the highest profit for both Paramount and Hasbro in the long run. No one really cares who plays the female lead in a transformers movie. No one realy cares if there is a female leadin a transformers movie at all. No one goes to see a movie directed by Michael Bay because they anticipate a good story. 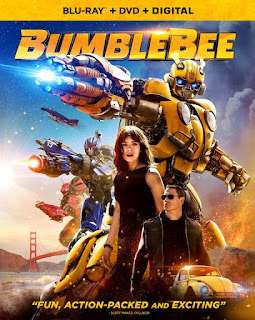 ROTM itslef, and the fact that DOTM was the third movie in a franchise ( BTW, a franchise where all 3 movies follow the same narrative; long lost cybertronian something or other gets discovered by humans, gets adolescent humans caught in the middle of a climactic battle)are the reasons for lower lower ticket sales. And as for the lower toy sales, you can only sell the same toy with different hubcaps so many times. Based on Fox's recent castings (This is 40, Friends with Kids, The Dictator) she has just enough starpower and talent to portray a bimbo. Why'd Bay cast her in TMNT, did he need his car washed again? @Aredo Strikes Back6/10/2013 9:40 PM: who would be "Aredo" ? 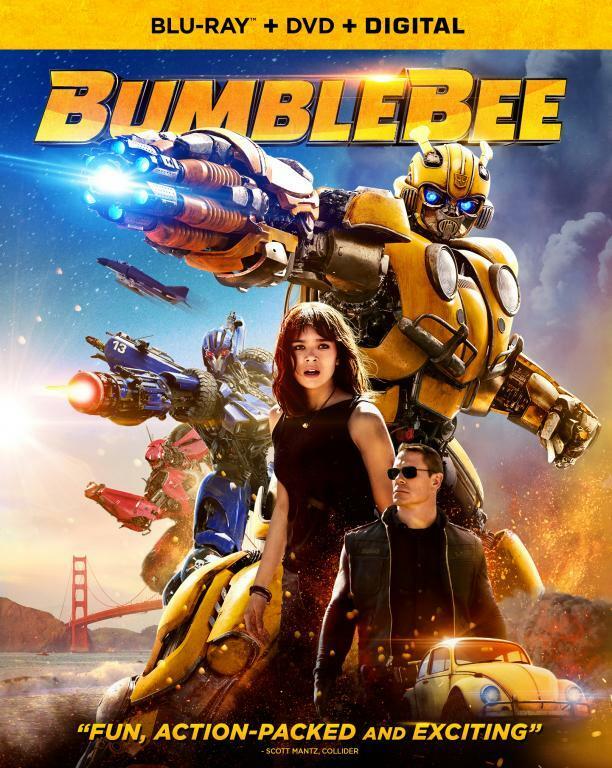 Transformers 3 sold less tickets because people didn't love it and if it didn't have the higher inflated 3D ticket price its boxoffice gross would have been a lot lower. Toys not selling well and low DVD/Blu-Ray disc sales just proved that the movie was badly accepted by adults, teenagers and little kids. The movie was boring, lazy, the CGI subpar compared to before, the action scenes just too short and pointless, the 3D absolutely useless. That is the reason why the movie is only a boxoffice success based on the higher number due to inflated 3D ticket prices. @Wynton: so you want Bay getting more Victoria's Secret top models that can't act a little bit to wash his cars, uh? All the hate against Megan Fox is beyond pathetic.